J. Backman, Jakobsson, M., Lovlie, R., and Polyak, L., “Rates of Sedimentation in the Central Arctic Ocean”, EOS Transactions, American Geophysical Union , vol. 83. San Francisco, CA, USA, pp. 0-0, 2002. C. Ware and Plumlee, M. D., “3D Geovisualization and the Structure of Visual Space”, in Exploring Geovisualization, no. J. Dykes, A.M. MacEachren & M.J. Kraak, New York, NY, USA: Elsevier, 2002, pp. 555-564. J. V. Gardner, Beaudoin, J., and Dartnell, P., “Multibeam Mapping of Selected Areas of the Outer Continental Shelf, Northwestern Gulf of Mexico - Data, Images and GIS”, U.S. Geological Survey (USGS), 2002. J. Beaudoin, Hughes Clarke, J. E., Van Den Ameele, E. J., and Gardner, J. V., “Geometric and Radiometric Correction of Multibeam Backscatter Derived from Reson 8101 Systems”, Canadian Hydrographic Conference (CHC). Toronto, Ontario, Canada, pp. 1-22, 2002. J. V. Gardner and Dartnell, P., “Multibeam Mapping of the Los Angeles, California Margin”, U.S. Geological Survey (USGS), 2002. B. J. Kraft, Mayer, L. A., Simpkin, P. G., and Goff, J. A., “Comparison of In-situ Compressional Wave Speed and Attenuation Measurements to Biot-stoll Model Predictions”, Journal of the Acoustical Society of America, vol. 112. Acoustical Society of America, Melville, NY, USA, pp. 2254-2254, 2002. J. Beaudoin, Gardner, J. V., and Hughes Clarke, J. E., “Bathymetry and Acoustic Backscatter of Selected Areas of the Outer Continental Shelf, Northwestern Gulf of Mexico”, U.S. Geological Survey (USGS), 2002. M. D. Plumlee and Ware, C., “Frame of Reference Interaction. User Interface Software Technology Demonstration”, User Interface Software Technology (UIST). Paris, Paris, France, pp. 41-42, 2002. M. Jakobsson, “Hypsometry and Volume of the Arctic Ocean and Its Constituent's Seas”, Geochemistry Geophysics Geosystems, vol. 3. American Geophysical Union , Washington DC, Washington DC, USA, pp. 1-18, 2002. R. Lovlie, Jakobsson, M., and Backman, J., “Paleointensity Confirms cm-scale Sedimentation Rates and Suggests Intervals with Non-uniform Deposition on the Lomonosov Ridge, Central Arctic Ocean”, EOS Transactions, American Geophysical Union , vol. 83. San Francisco, CA, USA, pp. 0-0, 2002. T. Hou, Mayer, L. A., and Rzhanov, Y., “Application of Wavelet Multi-resolution to Multibeam Backscatter for the Seabed Characterization”, Oceanology International (OI). London, London, UK, pp. 0-0, 2002. J. A. Goff, Mayer, L. A., Schwab, B., Traykovski, P., Wilkins, R., Jenkins, C., Kraft, B. J., Evans, R. L., and Buynevich, I., “Site Survey of the Martha's Vineyard Coastal Observatory: Backscatter, Grain Size and Temporal Evolution of Rippled Scour Depressions”, EOS Transactions, American Geophysical Union , vol. 83. San Francisco, CA, USA, pp. 0-0, 2002. M. Jakobsson, Mayer, L. A., and Armstrong, A. A., “The Compilation and Analysis of Data Relevant to a U.S. Claim Under United Nations Law of the Sea Article 76: Maps”, U.S. Congress, 2002. S. J. Dijkstra and Intelmann, S., “Mapping Benthic Habitat at Various scales in the Olympic National Marine Sanctuary, WA”, National Shellfisheries Association (NSA). New Orleans, LA, USA, pp. 0-0, 2002. J. V. Gardner, “Deep-water 'Reefs' of the Northern Gulf of Mexico”, ACM Computer Human Interaction (CHI). San Jose, CA, USA, 2002. 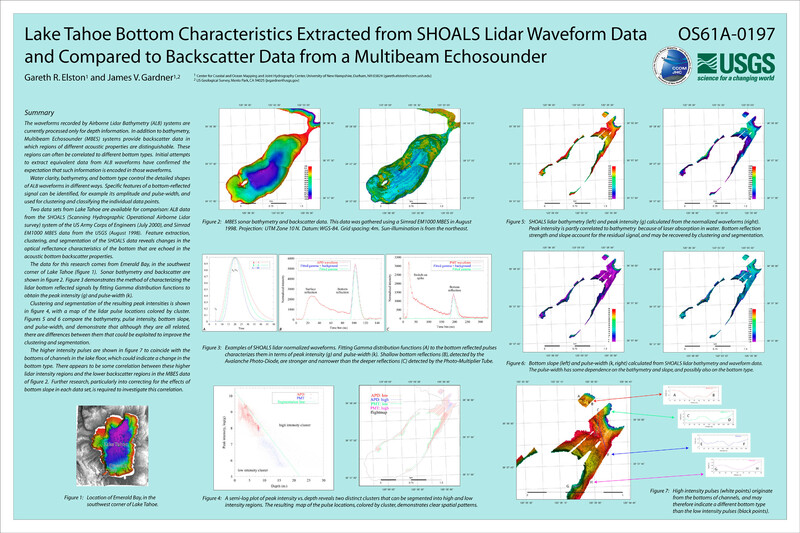 G. R. Elston and Gardner, J. V., “Lake Tahoe bottom characteristics extracted from SHOALS lidar waveform data and compared to backscatter data from a Multibeam echo sounder”, EOS Transactions, American Geophysical Union , vol. 83. San Francisco, CA, USA, pp. 0-0, 2002. M. Jakobsson, “A Prototype 1:6 Million Map ”, University of Hawaii, 2002. L. Fonseca and Mayer, L. A., “Detection Near-surface Gas with Acoustic Remote Sensing Data”, Latin-American Congress on Organic Geochemistry (LACOG). Cartagena, Cartagena, Columbia, pp. 0-0, 2002. 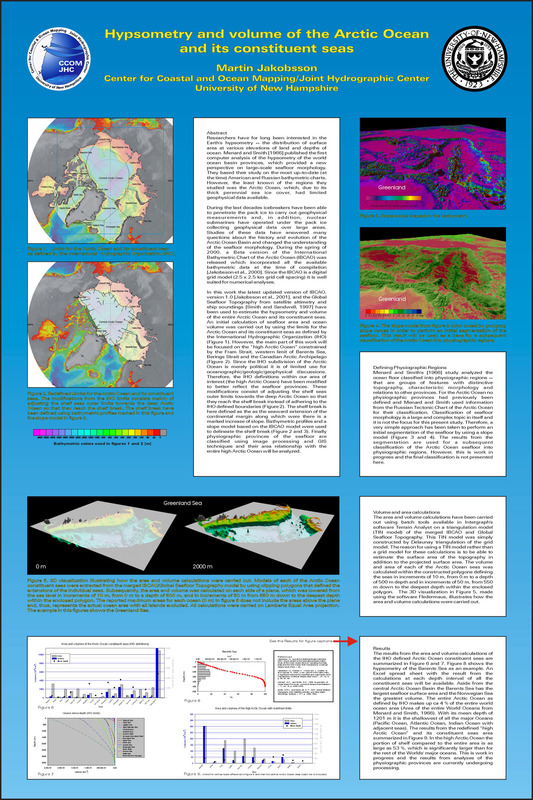 J. V. Gardner, Dartnell, P., and Sulak, K. J., “Multibeam Mapping of the West Florida Shelf, Gulf of Mexico”, U.S. Geological Survey (USGS), 2002. J. V. Gardner, Dartnell, P., Stone, J. C., Mayer, L. A., and Hughes Clarke, J. E., “Bathymetry and Selected Perspective Views Offshore Greater Los Angeles, CA”, U.S. Geological Survey (USGS), 2002. M. Jakobsson, “Dynamic 3D Visualization of Merged Geophysical and Geological Data Sets from the Arctic”, EOS Transactions, American Geophysical Union , vol. 83. San Francisco, CA, USA, pp. 0-0, 2002. L. Gee, Reed, B., and Mayer, L. A., “Interactive 3-D Visualization: An Important Element in Dealing with Increasing Data Volumes and Decreasing Resources”, EOS Transactions, American Geophysical Union , vol. 83. San Francisco, CA, USA, pp. 0-0, 2002. M. Jakobsson and Macnab, M., “3-D Visualization of IBCAO”, University of Hawaii, 2002. J. A. McConnel, Weber, T. C., Lauchle, G. C., and Gabrielson, T. B., “Development of a high frequency underwater acoustic intensity probe”, IEEE Oceans. Biloxi, MS, USA, pp. 0-0, 2002. B. J. Kraft, Mayer, L. A., Simpkin, P. G., Lavoie, P., Jabs, E., and Goff, J. A., “Calculation of in situ acoustic wave properties in marine sediments”, in Impact of Littoral Environmental Variability on Acoustic Predictions and Sonar Performance, no. N.G. Pace & F.N. Jensen, Dordrecht, Dordrecht, The Netherlands: Kluwer Press, 2002, pp. 115-130. J. V. Gardner and Sulak, K. J., “Multibeam Mapping of the Pinnacles Region, Gulf of Mexico”, U.S. Geological Survey (USGS), 2002. R. Arsenault and Ware, C., “Frustum Angle View Angle and Virtual Environment Navigation”, Symposium on Virtual Reality (SVR). Fortaleza, Ceara, Brazil, pp. 0-0, 2002. J. V. Gardner, “The Seafloor off Greater Los Angeles: Visualizing Gigabytes of Data”, EOS Transactions, American Geophysical Union, vol. 83, pp. 0-0, 2002. D. S. Sternlicht and de Moustier, C., “Near bottom sediment characterization offshore SW San Clemente Island”, IEEE Oceans. Biloxi, MS, USA, pp. 2086-2092, 2002. L. A. Mayer and Dr. Baldwin, K. C., “Shallow Water Survey 2001:High Resolution Surveys in Shallow Water”, Marine Technology Society Journal, vol. 34. Marine Technology Society, pp. 3-4, 2002. 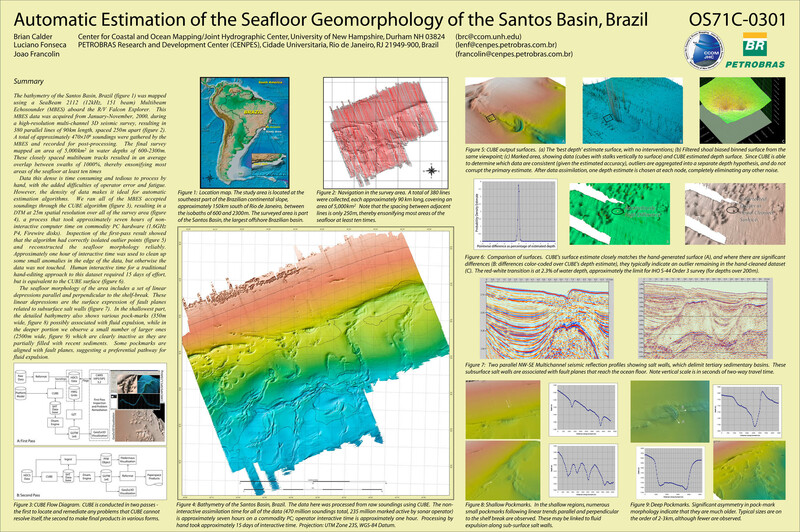 J. V. Gardner, Hughes Clarke, J. E., Mayer, L. A., and Dartnell, P., “Bathymetry and Acoustic Backscatter of the Mid and outer continental shelf, head of De Soto Canyon, Northeastern Gulf of Mexico”, U.S. Geological Survey (USGS), 2002. G. Alm, Macnab, M., Jakobsson, M., Kleman, J., and McCracken, M., “An Integrated Bathymetric and Topographic Digital Terrain Model of the Canadian Arctic Archipelago”, EOS Transactions, American Geophysical Union , vol. 83. San Francisco, CA, USA, pp. 0-0, 2002. M. Jakobsson and Mayer, L. A., “Using MGE Applications and Geomedia in Marine Geophysical/Geological Research”, ACM Computer Human Interaction (CHI). New Orleans, LA, USA, pp. 0-16, 2002. 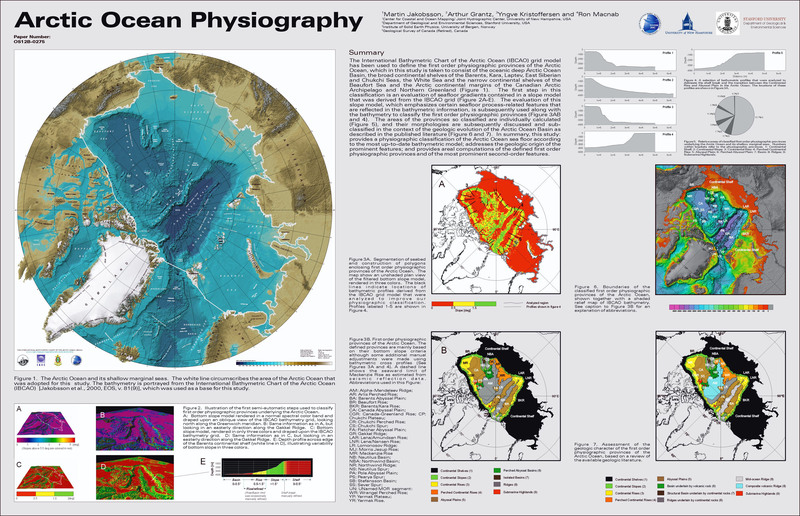 M. Jakobsson, Grantz, A., Kristoffersen, Y., and Macnab, R., “Arctic Ocean Physiography”, EOS Transactions, American Geophysical Union , vol. 83. San Francisco, CA, USA, pp. 0-0, 2002. J. Miksis-Olds, Tyack, P. L., and Buck, J. R., “Captive Dolphins, Tursiops truncatus, Develop Signature Whistles That Match Acoustic Features of Human-Made Model Sounds”, Journal of the Acoustical Society of America, vol. 112 (2). Acoustical Society of America, San Francisco, CA, pp. 728-739, 2002. C. Ware, Purchase, H., Colpoys, L., and McGill, M., “Cognitive Measurements of Graph Aesthetics”, Information Visualization, vol. 1. Palgrave Macmillan, pp. 103-110, 2002. L. A. Mayer, Jakobsson, M., and Armstrong, A. A., “The Compilation and Analysis of Data Relevant to a U.S. Claim Under United Nations Law of the Sea Article 76: A Preliminary Report”, University of New Hampshire (UNH), Center for Coastal and Ocean Mapping (CCOM)/Joint Hydrographic Center (JHC), 2002. L. Bartram and Ware, C., “Filtering and Brushing with Motion”, ACM Transactions on Applied Perception (TAP), vol. 1. Association for Computing Machinery (ACM), New York, NY, USA, pp. 66-79, 2002. R. Komerska, Ware, C., and Plumlee, M. D., “Haptic Interface for Center of Workspace Interaction”, International Symposium on Haptics Interfaces for Virtual Environments and Teleoperator Systems (HAPTICS). Orlando, FL, USA, pp. 352-353, 2002. B. J. Kraft, Mayer, L. A., Simpkin, P. G., Goff, J. 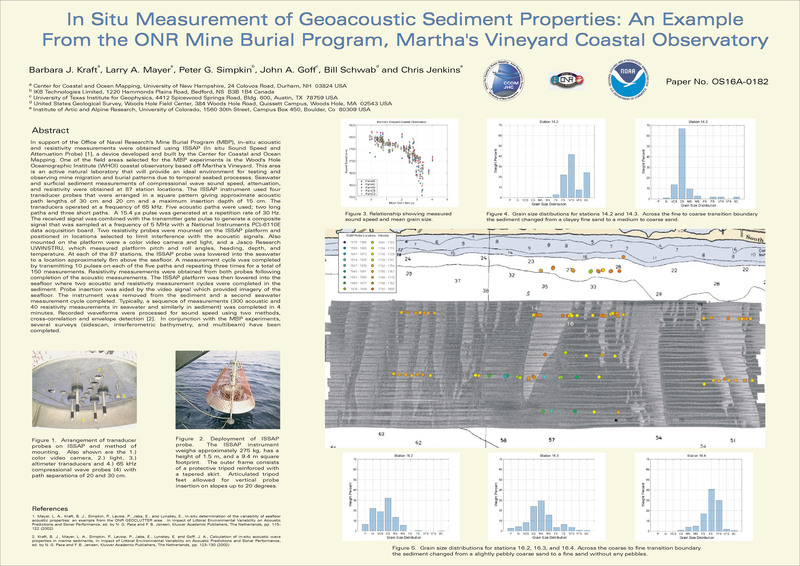 A., Schwab, B., and Jenkins, C., “In Situ Measurement of Geoacoustic Properties: An Example From the ONR Mine Burial Program, Martha's Vineyard Coastal Observatory”, 2002 Fall Meeting, American Geophysical Union. American Geophysical Union , San Francisco, CA, 2002. 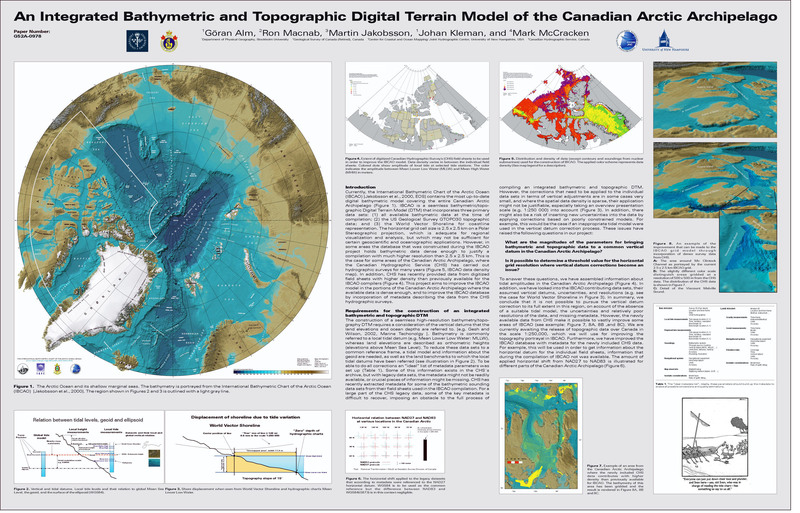 G. Alm, Macnab, R., Jakobsson, M., Kleman, J., and McCracken, M., “An Integrated Bathymetric and Topographic Digital Terrain Model of the Canadian Arctic Archipelago”, 2002 Fall Meeting, American Geophysical Union. American Geophysical Union , San Francisco, CA, 2002. D. H. House and Ware, C., “A Method for the Perceptual Optimization of Complex Visualizations”, Advanced Visual Interface (AVI). St. Andrews, New Brunswick, Canada, pp. 148-158, 2002. C. R. Bacon, Gardner, J. V., and Mayer, L. A., “Morphology, volcanism, and mass wasting in Crater Lake, Oregon”, Bulletin of the Geological Society of America, vol. 114. pp. 675-692, 2002. 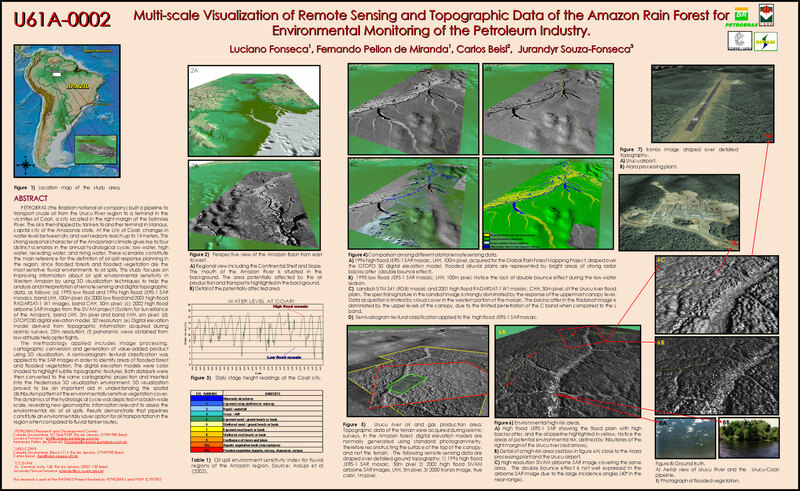 L. Fonseca, Miranda, F. P., and Beisl, C., “Multi-scale Visualization of Remote Sensing and Topographic Data of the Amazon Rain Forest”, EOS Transactions, American Geophysical Union . San Francisco, CA, USA, pp. 0-0, 2002. 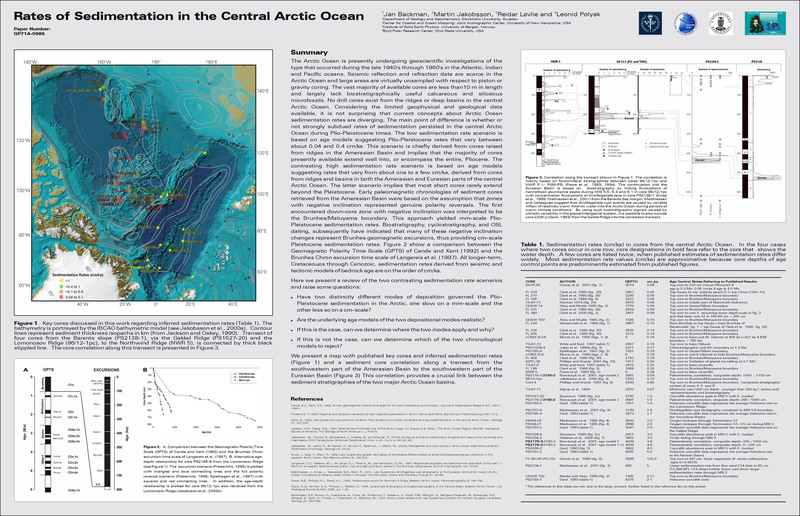 J. Backman, Jakobsson, M., Lovlie, R., and Polyak, L., “Rates of Sedimentation in the Central Arctic Ocean”, 2002 Fall Meeting, American Geophysical Union. American Geophysical Union , San Francisco, CA, 2002. 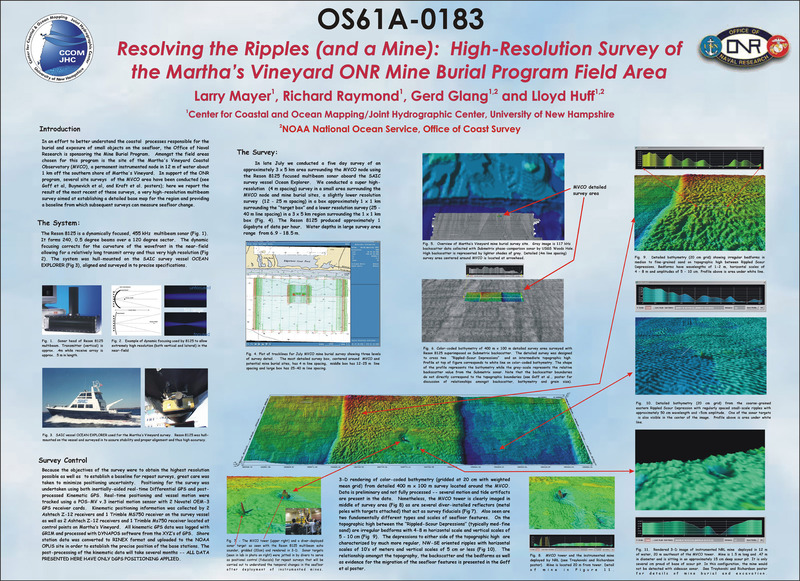 L. A. Mayer, Raymond, R., Glang, G., and Huff, L. C., “Resolving the Ripples (and a Mine): High-Resolution Multibeam Survey of Martha's Vineyard ONR Mine Burial Program Field Area”, 2002 Fall Meeting, American Geophysical Union. American Geophysical Union , San Francisco, CA, 2002. R. Laramee and Ware, C., “Rivalry and Interference with a Head Mounted Display”, ACM Transactions on Computer-Human Interaction (CHI), vol. 9. Association for Computing Machinery (ACM), New York, NY, USA, pp. 1-14, 2002. 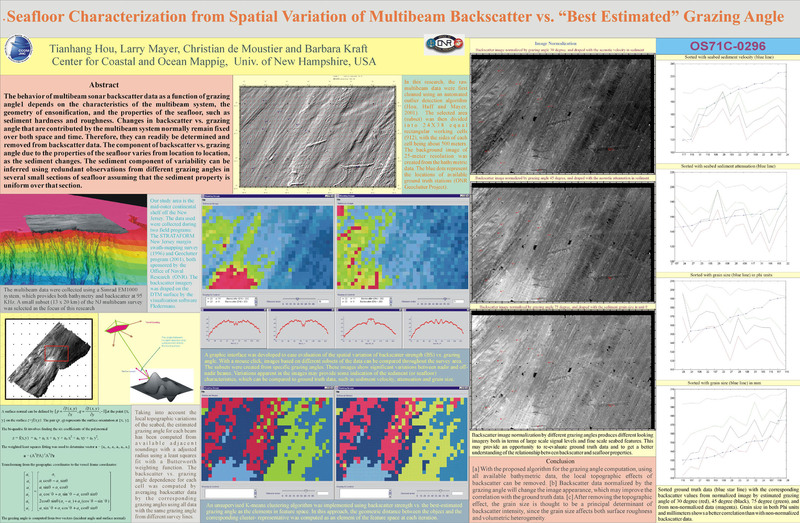 T. Hou, Mayer, L. A., de Moustier, C., and Kraft, B. J., “Seafloor Characterization from Spatial Variation of Multibeam Backscatter vs."Best Estimated" Grazing Angle”, EOS Transactions, American Geophysical Union . San Francisco, CA, USA, pp. 0-0, 2002. A. T. Hewitt, “Seafloor Geology, Deglacial History, and Early Post Glacial Evolution of Eastern Juan De Fuca Strait”, University of New Hampshire, Durham, NH, 2002. M. Hovland, Gardner, J. V., and Judd, A. G., “The significance of pockmarks to understanding fluid flow processes and geohazards”, Geofluids, vol. 2. pp. 127-136, 2002. M. D. Plumlee and Ware, C., “Zooming, Multiple Windows, and Visual Working Memory”, Advanced Visual Interface (AVI). St. Andrews, New Brunswick, Canada, pp. 59-68, 2002. J. A. Austin, Goff, J. A., Gulick, S. P., Fulthorpe, C., Nordfjord, S., Wiederspahn, M., Saustrup, S., Schock, S. G., Wulf, J., Gjerding, K., Mayer, L. A., and Sommerfield, C. K., “Assessing the 'GEO' in GEOCLUTTER: New Chirp Sonar, Sampling, and Compressional Wave Veolcity Results from the New Jersey Shelf”, EOS Transactions, American Geophysical Union , vol. 82. San Francisco, CA, USA, pp. 0-0, 2001. D. C. Mosher, Kung, R., and Hewitt, A. T., “Surficial Geology of the Eastern Juan de Fuca Strait”, Geological Survey of Canada (GSC), 2001. L. E. Fenstermacher, Crawford, G. B., Borgeld, J. C., Britt, T., George, M., Klien, A., Driscoll, N. W., and Mayer, L. A., “Enhanced Acoustic Reflectivity Due to High Abundance of Sand Dollars, Dendraster excentricus”, Marine Georesources and Geotechnology, vol. 19. Taylor & Francis, pp. 135-145, 2001. H. Al-Hanbali, Holm, N., and Jakobsson, M., “Manganese, Carbon, and Nitrogen Isotope Composition of Deep Sediments: Tools for Monitoring Paleoceanographic Conditions in Central Arctic Ocean”, Marine Geology. Elsevier, New York, NY, USA, 2001. M. D. Plumlee, Ware, C., Komerska, R., Chappell, A. G., and Arsenault, R., “Monitoring Distributed Autonomous Entities Through Linkable 3D Windows”, Unmanned Untethered Submersible Technology Symposium (UUST). Durham, NH, USA, pp. 0-0, 2001. G. Melvin, Li, Y., Mayer, L. A., and Clay, A., “Automated tools for sonar logging on commercial fishing vessels”, ICES Journal of Marine Science, vol. 59. Elsevier, New York, NY, USA, pp. 226-245, 2001. M. Jakobsson, “Hypsometry and Volume of the Arctic Ocean and It's Constituent Seas”, The Royal Swedish Academy of Sciences. Stockholm, Stockholm, Sweden, pp. 0-1, 2001. L. Fonseca, Mayer, L. A., and Paton, M., “ArcView Objects in the Fledermaus Interactive 3-D Visualization System: Examples from the STRATAFORM GIS”, in Undersea with GIS, no. D. Wright, Redlands, CA, USA: ESRI Press, 2001, p. 23. M. Jakobsson and I.B.C.A.O Board Members, “Improvements to the International Bathymetric Chart of the Arctic Ocean: Updating the database and the grid model”, EOS Transactions, American Geophysical Union, vol. 84. American Geophysical Union , Washington DC, Washington DC, USA, pp. 0-0, 2001. L. Gee, Paton, M., Mayer, L. A., Gardner, J. V., and Depner, J., “Interactive 3-D Visualization and Analysis of Multi-sensor, Multi-resolution Data Sets”, International Conference on High-Resolution Survey in Shallow Water (HRSSW). Portsmouth, NH, USA, pp. 0-0, 2001. D. C. Mosher, Kung, R., and Hewitt, A. T., “Modern Surface Morphology of the Eastern Juan de Fuca Strait”, Geological Survey of Canada (GSC), 2001. L. Gee, Paton, M., Mayer, L. A., Ware, C., Gardner, J. V., and Depner, J., “Interactive 3D visualization and analysis of multi-sensor, multi-relolution data sets”, International Conference on High-Resolution Survey in Shallow Water (HRSSW). Portsmouth, NH, USA, 2001. L. Fonseca, Mayer, L. A., Orange, D., and Driscoll, N. W., “The High Frequency Backscattering Angular Response of Gassy Sediments: Model/Data Comparisons from the Eel River Margin, California”, Journal of the Acoustical Society of America, vol. 111. Acoustical Society of America, Melville, NY, USA, pp. 2621-2631, 2001. B. D. Bornold, Hewitt, A. T., and McDonald, D., “250,000 Years of Glacier Advance and Retreat in Southern Alaska Recorded by Ice-rafted Debris in Deep-sea Cores from the Northeast Pacific”, Quaternary Research. Elsevier, New York, NY, USA, 2001. L. Bartram and Ware, C., “Filtering and Intergrating Visual Information with Motion”, Information Visualization, vol. 1. Palgrave Macmillan, pp. 66-79, 2001. 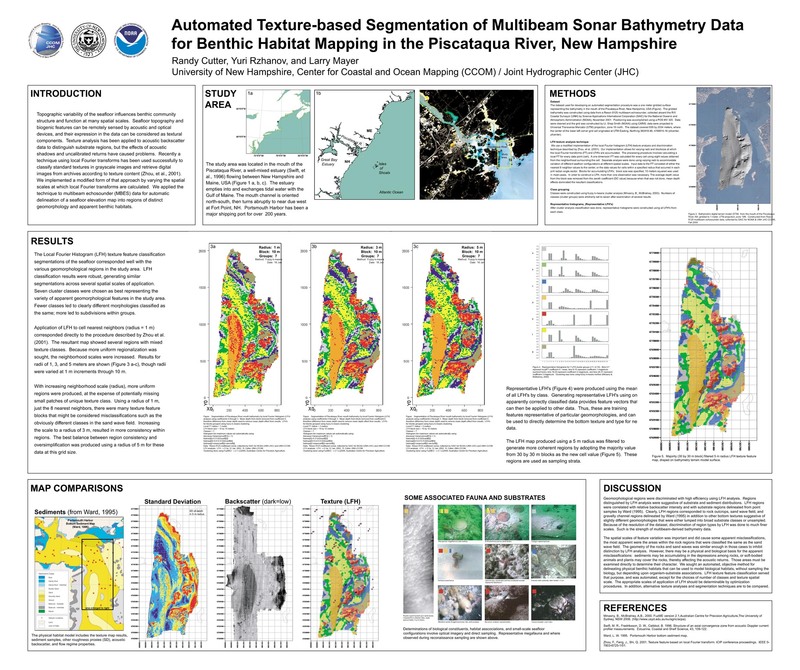 L. G. Ward and Bub, F. L., “Suspended Sediment Dynamics in the Great Bay Estuary, NH: Patterns and Controlling Processes”, Geological Society of America (GSA), vol. 33. Boston, MA, USA, 2001. R. Laramee and Ware, C., “Visual Interference with a Transparent Head Mounted Display”, ACM Computer Human Interaction (CHI). Seattle, WA, USA, pp. 323-324, 2001. J. Mangerud, Astakov, V., Jakobsson, M., and Svendsen, J. I., “Huge Iceage Lakes in Russia”, Journal of Quaternary Science, vol. 16. Wiley InterScience, pp. 773-777, 2001. M. Jakobsson, “Sedimentation in the Central Arctic Ocean: What We Knew in 1996 and What We Know Today”, Progress in the Arctic Ocean Research Over the Past Decades (PAOR). St. Andrews, New Brunswick, Canada, pp. 0-0, 2001. J. A. Dingler, Kent, G. M., Babcock, J. A., Driscoll, N. W., Harding, A. J., Seitz, G. G., Gardner, J. V., Goldman, C. R., Mayer, L. A., Morgan, C. W., and Richards, B. C., “Differential Strain Accumulation Across Lake Tahoe as Measured From Submerged Paleo-shorelines”, EOS Transactions, American Geophysical Union , vol. 82. San Francisco, CA, USA, pp. 0-0, 2001. C. de Moustier, “Field Evaluation of Sounding Accuracy in Deep Water Multibeam Swath Bathymetry”, IEEE Oceans, vol. 3. Honolulu, HI, USA, pp. 1761-1765, 2001. W. B. Kearse, Parrish, C. E., Schiefele, J., Friedrich, A., and Kubbat, W., “RTCA Special Committee 193/EUROCAE Working Group 44 Airport and Terrain Database Acquisition for Aviation Applications”, International Air Safety Seminar (IASS). Athens, Attica, Greece, 2001. T. C. Gallaudet and de Moustier, C., “Corrections to: On Optimal Shading for Arrays of Irregularly-spaced or Noncoplanar Elements”, IEEE Journal of Oceanic Engineering, vol. 26. IEEE, Washington DC, Washington DC, USA, pp. 416-419, 2001. M. Macnab, Jakobsson, M., and Svendsen, J. I., “IASC/IOC/IAO Editorial Board for the International Bathymetric Chart of the Arctic Ocean”, Geological Survey of Canada (GSC), 2001. G. R. Elston, Bell, J. M., and Capus, C. G., “Analysis of the Effects of Numerical Dispersion on Pulses in Finite-difference and Pseudospectral Time-domain Methods”, Journal of the Acoustical Society of America, vol. 110. Acoustical Society of America, Melville, NY, USA, pp. 2618-2618, 2001. A. T. Hewitt, “Seafloor Geology of the Eastern Strait of Juan de Fuca, British Columbia and Washington”, Marine Geology, vol. 177. Elsevier, New York, NY, USA, pp. 295-316, 2001. M. E. Weber, Mayer, L. A., Hillaire-Marcel, C., Bilodeau, G., Rack, F., Hiscott, R. N., and Aksu, A. E., “Derivation of del180 from sediment cores log data: Implications for Millennial-scale climate change in the Labordor Sea”, Paleoceanography, vol. 16. American Geophysical Union , Washington DC, Washington DC, USA, pp. 503-514, 2001. 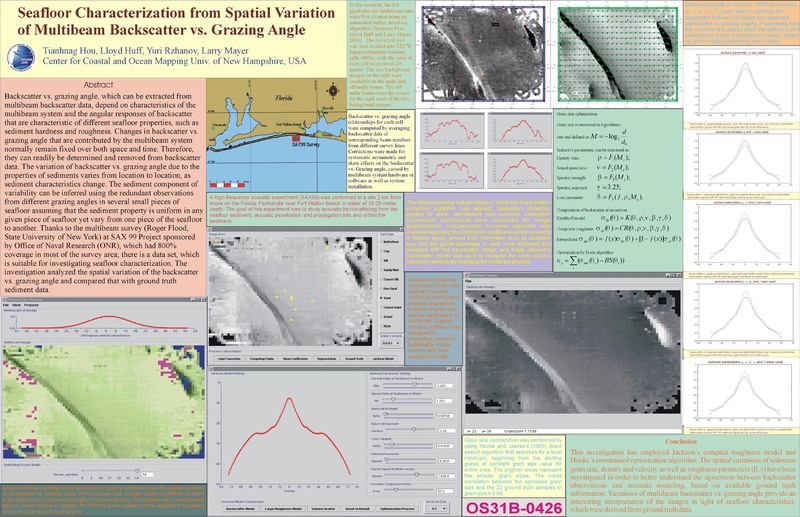 L. A. Mayer, Fonseca, L., Ware, C., Paton, M., Gee, L., Gardner, J. V., and Orange, D., “Interactive 3-D Visualization and Exploration of Deepwater Geohazards”, Offshore Technology Conference (OTC). Houston, TX, USA, pp. 0-11, 2001. L. A. Mayer, Li, Y., and Melvin, G., “3-D visualization for pelagic fisheries assessment and research”, ICES Journal of Marine Science, vol. 59. Elsevier, New York, NY, USA, pp. 216-225, 2001. M. Jakobsson, Backman, J., Lovlie, R., and Murray, A., “Implications of Fast Sedimentation Rates in the Central Arctic Ocean”, Norwegian Geological Society (NGS). St. Andrews, New Brunswick, Canada, pp. 0-0, 2001. M. Jakobsson, Lovlie, R., Arnold, E. M., Backman, J., Polyak, L., Knutsen, J. O., and Musatov, E., “Pleistocene Stratigraphy and Paleoenvironmental Variation from Lomonosov Ridge Sediments Central Artic Ocean”, Global and Planetary Change, vol. 31. Elsevier, New York, NY, USA, pp. 1-21, 2001. D. W. Ramsey, Robinson, J. E., Dartnell, P., Bacon, C. R., Gardner, J. V., Mayer, L. A., and Buktenica, M., “Crater Lake Revealed: Using GIS to Visualize and Analyze Post Caldera Volcanoes Beneath Crater Lake”, EOS Transactions, American Geophysical Union , vol. 82. San Francisco, CA, USA, pp. 0-0, 2001. J. R. Adams, Dijkstra, S. J., Grizzle, R. E., Nelson, J., and Ward, L. G., “Comparison of Acoustic Techniques, Videography, and Quadrant Sampling for Characterizing Subtidal Oyster Reefs”, National Shellfisheries Association (NSA). Mystic, CT, USA, 2001. C. Ware, “Designing with a 2 1/2-D Attitude”, Information Design Journal, vol. 10. John Benjamins Publishing Company, pp. 255-262, 2001. C. Ware, Plumlee, M. D., Arsenault, R., Mayer, L. A., Smith, S. M., and House, D. H., “GeoZui3D: Data Fusion for Interpreting Oceanographic Data”, IEEE Oceans. Honolulu, HI, USA, pp. 2498-2502, 2001. M. Jakobsson, “Hypsometry and Volume of the Arctic Ocean and Its Constituent's Seas”, Progress in the Arctic Ocean Research Over the Past Decades (PAOR). St. Andrews, New Brunswick, Canada, pp. 0-0, 2001. 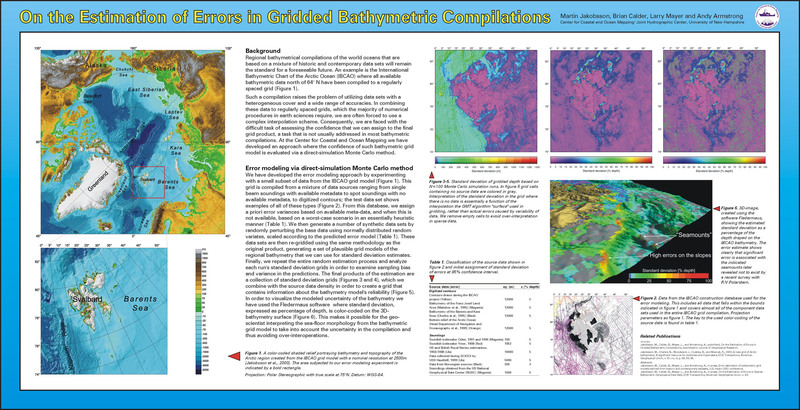 M. Jakobsson and Cherkis, N., “Improvement to the International Bathymetric Chart of the Arctic Ocean (IBCAO): Updating the Data Base and the Grid Model”, EOS Transactions, American Geophysical Union , vol. 84. San Francisco, CA, USA, pp. 1-5, 2001. J. V. Gardner, “Mapping Southern Puget Sound Delta Fronts after the 2001 Nisqually Earthquake”, EOS Transactions, American Geophysical Union, vol. 82. American Geophysical Union , Washington DC, Washington DC, USA, pp. 485-489, 2001. 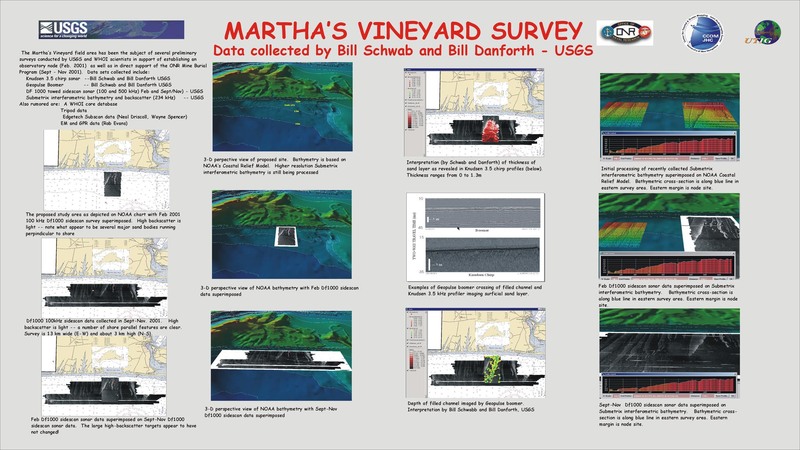 L. A. Mayer, “Martha's Vineyard Survey: Data collected by Bill Schwab and Bill Danforth - USGS”. 2001. J. I. Svendsen, Astakov, V., Alexanderson, H., Demidov, I., Dowdeswell, J., Gataulin, V., Henriksen, M., Hjort, C., and Jakobsson, M., “The Maximum Extent of the Saalian and Weichselian Glaciations in Eurasis”. 2001. L. Fonseca, “A Model for Backscattering Angular Response of Gassy Sediments: Applications to Petroleum Exploration and Development Programs”, University of New Hampshire, Durham, NH, 2001. L. Bartram, Ware, C., and Calvert, T., “Moving Icons, Detection and Distraction”, Interact. Tokyo, Tokyo, Japan, pp. 0-9, 2001. L. G. Ward and Adams, J. R., “A Preliminary Assessment of Tidal Flooding Along the New Hampshire Coast: Past, Present and Future”, University of New Hampshire, Durham, NH, 2001. T. Hou, Huff, L. C., Rzhanov, Y., and Mayer, L. A., “Seafloor Characterization from Spatial Variation of Multibeam Backscatter vs. Grazing Angle”, EOS Transactions, American Geophysical Union , vol. 83. San Francisco, CA, USA, pp. 0-0, 2001. S. J. Dijkstra, “Seafloor Characterization Using Vertical Incidence Echosounders: A Study in Portsmouth Harbor and the Great Bay Estuary, New Hampshire”, International Conference on High-Resolution Survey in Shallow Water (HRSSW). Portsmouth, NH, USA, pp. 0-0, 2001. 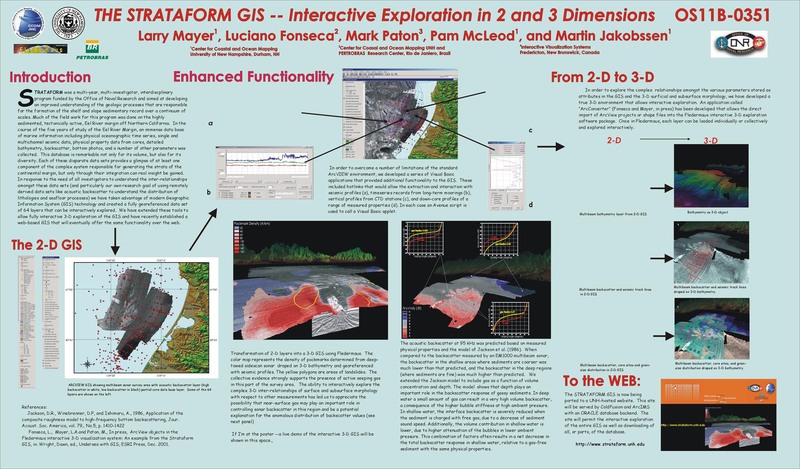 L. A. Mayer, Fonseca, L., Paton, M., McLeod, P., and Jakobsson, M., “The STRATAFORM GIS: Interactive Exploration in 2 and 3 Dimensions”, EOS Transactions, American Geophysical Union , vol. 82. San Francisco, CA, USA, pp. 0-0, 2001. 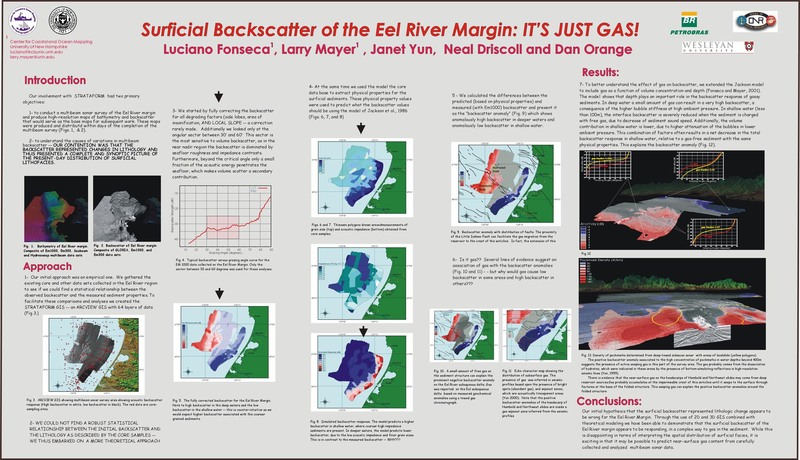 L. Fonseca, Mayer, L. A., Yun, J., Driscoll, N. W., and Orange, D., “Surficial Backscatter of the Eel River Margin: IT'S JUST GAS!”. 2001. P. Irani, Ware, C., and Tingley, M., “Using Perceptual Syntax to Enhance Semantic Content in Diagrams”, IEEE Computer Graphics and Application, vol. 21. IEEE, Washington DC, Washington DC, USA, pp. 76-85, 2001. M. Jakobsson, Mangerud, J., Astakov, V., and Svendsen, J. I., “Volumes and Areas of Early Weichselian Ice Dammed Lakes in Northern Russia”, EOS Transactions, American Geophysical Union . San Francisco, CA, USA, 2001. C. Ware, Information Visualization Perception for Design, 1st ed. Burlington, MA, USA: Morgan Kaufman, 2000, p. 438. L. A. Mayer, LeBlanc, L. R., and Schock, S. G., “Joe Kravitz and the Chirp Sonar: The Vision of a Prophet, the Patience of a Saint”, EOS Transactions, American Geophysical Union , vol. 81. San Francisco, CA, USA, pp. 0-0, 2000. R. D. Flood, Ferrini, V. L., and Mayer, L. A., “Multibeam Bathymetry and Backscatter at 300 kHz in the SAX99 Study Area, West Florida Shelf”, EOS Transactions, American Geophysical Union , vol. 81. San Francisco, CA, USA, pp. 0-0, 2000. J. V. Gardner, Mayer, L. A., and Hughes Clarke, J. E., “Morphology and processes in Lake Tahoe (California-Nevada)”, Geological Society of America Bulletin (GSAB), vol. 112. The Geological Society of America (GSA), pp. 736-746, 2000. S. G. Schock, LeBlanc, L. R., and Mayer, L. A., “The Development of Chirp Sonar Technology and Its Applications”, EOS Transactions, American Geophysical Union , vol. 81. San Francisco, CA, USA, pp. 0-0, 2000. 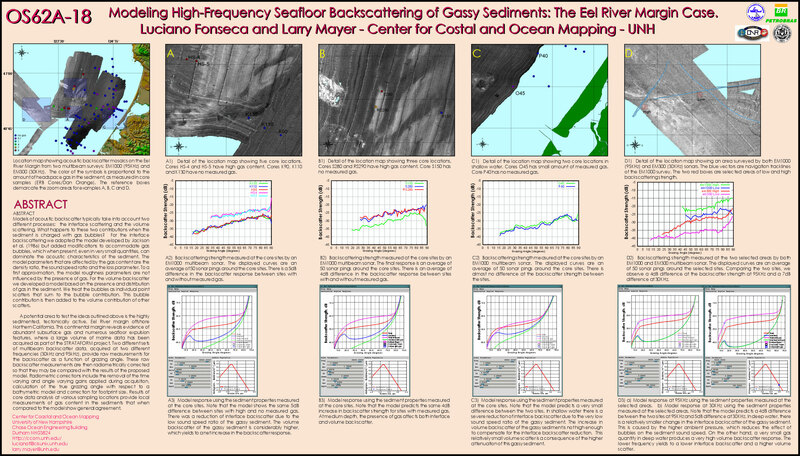 L. Fonseca and Mayer, L. A., “Modeling High-Frequency Seafloor Backscattering of Gassy Sediments: The Eel River Margin Case”, EOS Transactions, American Geophysical Union , vol. 81. San Francisco, CA, USA, pp. 0-0, 2000. C. F. Lewis, Mayer, L. A., Mukhopadhyay, P. K., Kruge, M. A., Coakley, J. P., and Smith, D. M., “Multibeam sonar backscatter lineaments and anthropogenic organi components in lacustrine silty clay, evidence of shipping in western Lake Ontario”, International Journal of Coal Geology, vol. 43. Elsevier, New York, NY, USA, pp. 307-324, 2000. 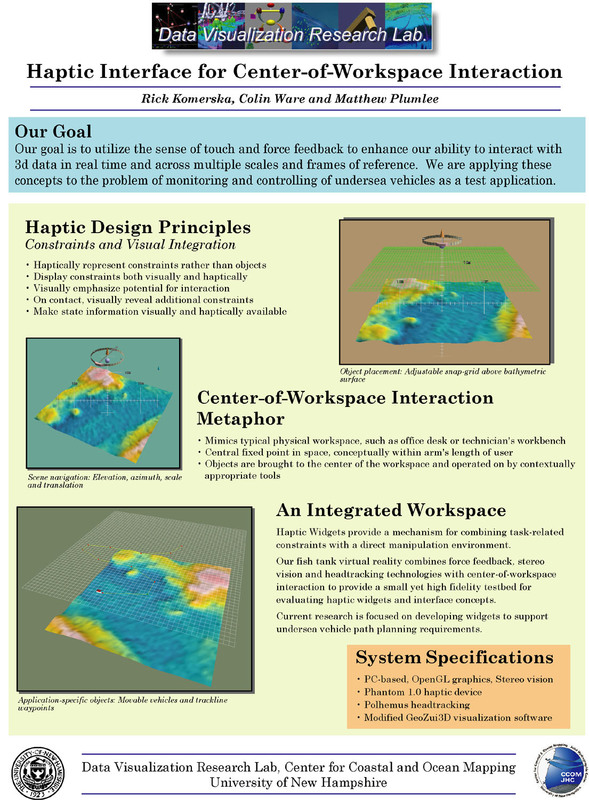 L. A. Mayer, Pato, C. W., Gee, L., Gardner, J. V., and Ware, C., “Interactive 3-D Visualization: A tool for seafloor navigation, exploration, and engineering”, IEEE Oceans. Providence, RI, USA, pp. 913-920, 2000. S. J. Dijkstra and Mayer, L. A., “TracEd: A Remote Acoustic Seafloor Characterization System for Use with Vertical Incidence Echosounders”, IEEE Oceans. IEEE, Washington DC, Washington DC, USA, pp. 1211-1217, 2000. M. E. Weber, Mayer, L. A., and Hillaire-Marcel, C., “Physical Properties and Their Relation to High Frequency Climate Change as Recoded by IMAGES Cores From the Labrador Sea”, EOS Transactions, American Geophysical Union , vol. 81. San Francisco, CA, USA, pp. 0-0, 2000. J. V. Gardner, Mayer, L. A., Buktenica, M., Bacon, C. R., Dartnell, P., Hellequin, L., Ramsey, D. W., and Robinson, J. E., “High-resolution Multibeam Mapping of Crater Lake, Oregon”, EOS Transactions, American Geophysical Union , vol. 81. San Francisco, CA, USA, pp. 0-0, 2000. T. C. Gallaudet and de Moustier, C., “On Optimal Shading for Arrays of Irregularly-spaced or Noncoplanar Elements”, IEEE Journal of Oceanic Engineering, vol. 25. IEEE, Washington DC, Washington DC, USA, pp. 553-567, 2000. P. Irani and Ware, C., “Diagrams Based on Structured Object Perception”, Advanced Visual Interface (AVI). Palermo, Palermo, Italy, pp. 61-67, 2000. R. Arsenault and Ware, C., “Eye-Hand Co-ordination with Force Feedback”, ACM Computer Human Interaction (CHI). The Hague, South Holland, The Netherlands, pp. 0-8, 2000. L. Fonseca and Mayer, L. A., “Modeling High-Frequency Seafloor Backscattering of Gassy Sediments: The Eel River Margin Case”. 2000. A. A. Armstrong and Mayer, L. A., “The NOAA Joint Hydrographic Center and the UNH Center for Coastal and Ocean Mapping: An Educational and Research Partnership of the Federal Government”, IEEE Oceans, vol. 1. IEEE, Washington DC, Washington DC, USA, pp. 705-710, 2000. 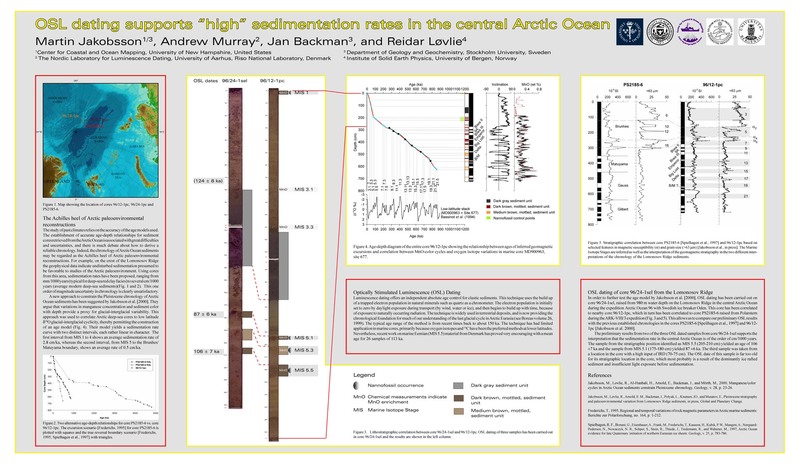 M. Jakobsson, Murray, A., Backman, J., and Lovlie, R., “OSL Dating Supports "High" Sedimentation Rates in Central Arctic Ocean”, EOS Transactions, American Geophysical Union , vol. 81. San Francisco, CA, USA, 2000. M. S. Marlow, Gardner, J. V., and Normark, W. R., “Using high-resolution multibeam bathymetry to identify seafloor surface rupture along the Palos Verdes fault complex in offshore southern California”, Geology, vol. 28. Geological Society of America, Boulder, CO, pp. 587-590, 2000. J. E. Hughes Clarke, Mayer, L. A., Shaw, J., Parrott, R., Lamplugh, M., and Bradford, J., “Data handling methods and target detection results for multibeam and sidescan data collected as part of the search for SwissAir Flight 111”, Shallow Water Survey Conference (SWS). St. Andrews, New Brunswick, Canada, pp. 0-11, 1999. L. A. Mayer, Fonseca, L., Pacheco, M., Galway, S., Martinez, J., and Hou, T., “The STRATAFORM GIS”, U.S. Office of Naval Research (ONR). St. Andrews, New Brunswick, Canada, pp. 0-0, 1999. C. Ware, Neufeld, E. M., and Bartram, L., “Visualizing Causal Relations”, IEEE Information Visualization (InfoVis). San Francisco, CA, USA, pp. 39-42, 1999. L. G. Ward and Birch, F. S., “Sedimentology of the New Hampshire Inner Continental Shelf Based on Subbottom Seismics, Side Scan Sonar, Bathymetry and Bottom Samples”, Marine Georesources and Geotechnology, vol. 17. Taylor & Francis, pp. 165-172, 1999. J. W. Good, “Benefits of Geographic Information Systems for State and Regional Ocean Management”, Oregon State University , Corvallis, OR, USA, 1999. J. V. Gardner, “High-resolution multibeam bathymetry of East and West Flower Gardens and Stetson Banks, Gulf of Mexico”, Gulf of Mexico Science, vol. 16. pp. 131-143, 1999. J. V. Gardner, Hughes Clarke, J. E., Mayer, L. A., Kleiner, A., and Paton, M., “Mapping a Continental Shelf and Slope in the 1990s: A Tale of Three Multibeams”, Shallow Water Survey Conference (SWS). Sydney, Australia, pp. 0-11, 1999. C. Ware and Rose, J., “Rotating Virtual Objects with Real Handles”, ACM Transactions on Applied Perception (TAP), vol. 6. Association for Computing Machinery (ACM), New York, NY, USA, pp. 162-180, 1999. J. Locat, Gardner, J. V., Lee, H. J., Mayer, L. A., and Hughes Clarke, J. E., “Using multibeam sonar surveys for submarine landslide investigations”, in Slope Stability Engineering, Balkema, 1999, pp. 127-134. F. P. Miranda, Fonseca, L., and Carr, J., “Semivariogram textural classification of JERS-1 (Fuyo-1) SAR data obtained over a flooded area of the Amazon rainforest”, International Journal of Remote Sensing, vol. 19. Taylor & Francis, pp. 549-556, 1998. N. W. Driscoll, Orange, D., Fonseca, L., and Mayer, L. A., “High Resolution Side-Scan and Seismic Images of Landslides on the Northern California Continental Shelf”, American Geophysical Union (AGU). San Francisco, CA, USA, pp. 0-0, 1998. L. G. Ward, Kearney, M. S., and Stevenson, J. C., “Variations in sedimentary environments and accretionary processes in estuarine marshes undergoing rapid sea level rise, Chesapeake Bay”, Marine Geology, vol. 151. Elsevier, New York, NY, USA, pp. 111-134, 1998. C. Ware and Rose, J., “Real Handles, Virtual Images”, ACM Computer Human Interaction (CHI). Los Angeles, CA, USA, pp. 235-236, 1998. J. E. Hughes Clarke, Gardner, J. V., Torresan, M., and Mayer, L. A., “The limits of spatial resolution achievable using a 30kHz multibeam sonar: model predictions and field results”, IEEE Oceans, vol. 3. IEEE, Washington DC, Washington DC, USA, pp. 1823-1827, 1998. C. Ware, Gobrecht, C., and Paton, M., “Dynamic adjustment of stereo display parameters”, IEEE Transactions on Geoscience and Remote Sensing, vol. 28. IEEE, Washington DC, Washington DC, USA, pp. 56-65, 1998. G. Parker, Franck, G., and Ware, C., “Visualization of large nested graphs in 3D: Navigation and Interaction”, Journal of Visual Languages and Computing, vol. 9. Elsevier, New York, NY, USA, pp. 299-317, 1998. A. R. Cross, Armstrong, R. L., Gobrecht, C., Paton, M., and Ware, C., “Three Dimensional Imaging of the Belousov Zhabotinsky Reaction using Magnetic Resonance”, Magnetic Resonance Imaging, vol. 15. Elsevier, New York, NY, USA, pp. 719-728, 1997. M. Paton, Mayer, L. A., and Ware, C., “Interactive 3-D Tools for Pipeline Route Planning”, IEEE Oceans, vol. 2. Halifax, Nova Scotia, Canada, pp. 1216-1222, 1997. C. Ware, Franck, G., Parkhi, G., and Dudley, T., “Layout for Visualizing Large Software Structures in 3D”, Interanational Conference on Visual Information Systems (VISUAL). San Diego, CA, USA, pp. 215-223, 1997. C. Ware and Fleet, D., “Context Sensitive Flying Interface”, Computer Graphics International (CGI). Hasselt, Limburg, Belgium, pp. 39-46, 1997. C. Ware and Lowther, K., “Selection using a one-eyed cursor in a Fish Tank VR environment”, ACM Transactions on Computer-Human Interaction (CHI), vol. 4. Association for Computing Machinery (ACM), New York, NY, USA, pp. 309-322, 1997. K. Lowther and Ware, C., “Vection”, ACM Computer Human Interaction (CHI). Vancouver, British Columbia, Canada, pp. 233-234, 1996. L. F. Johnson and Ware, C., “Structuring the First Course In HCI”, Conference on the Teaching of Computing. Dublin, Leinster, Ireland, pp. 69-73, 1996. L. Fusillo, de Moustier, C., Satriano, J. H., and Zietz, S., “In-Situ Far-Field Calibration of Multibeam Sonar Arrays for Precise Backscatter Imagery”, IEEE Oceans. St. Andrews, New Brunswick, Canada, pp. 47-49, 1996. F. P. Miranda, Fonseca, L., Carr, J., and Taranik, J., “Analysis of JERS-1 SAR data for vegetation discrimination in northwestern Brasil using the semivariogram textural classifier (STC)”, International Journal of Remote Sensing, vol. 17. Taylor & Francis, pp. 3523-3529, 1996. C. Gobrecht, Bhavsar, V., and Ware, C., “PVMtrace: A 3D distibuted program visualizer”, International Conference on High Performance Computers (HPCS). Ottawa, Ontario, Canada, 1996. L. Fonseca, “Correções radiométricas dos dados sonográficos da Bacia de Campos (Radiometric Corrections of sidescan sonar data from Campos Basin. )”, Brazilian Symposium of Remote Sensing (BSRS). Salvador, Bahia, Brazil, pp. 0-0, 1996. C. Ware, “Multimedia Output Devices and Techniques”, ACM Computing Surveys, vol. 28. Association for Computing Machinery (ACM), New York, NY, USA, pp. 181-183, 1996.